Aquana Beach Resort is set between lush tropical rainforest and a stunning beaches, only 15 minutes drive from Port Vila. 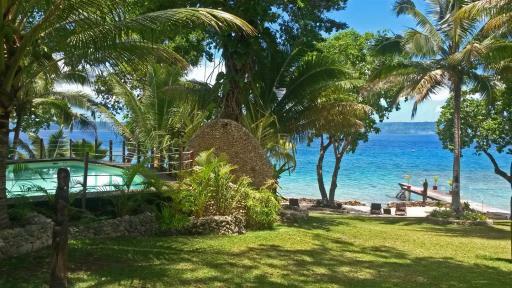 Sixteen 1 and 2 bedroom bungalows offer ocean views and stylish modern Vanuatu accommodation. Guests can enjoy the variety of water activities on offer and spend their evenings dining in the restaurant or on the jetty taking in the beautiful sunsets. Situated in Port Vila's scenic Mele Bay, Benjor Beach Club is located on 23 acres of tropical gardens near the town centre. Conveniently close to all your needs but away from the tourist bustle, the resort features self-contained units and villas with access to a swimming pool, restaurant, tennis courts, BBQ Area, mini golf, wedding chapel and a number of excellent facilities. A unique resort on Pango's surf beach, Breakas Beach Resort offers boutique accommodation nestled among lush, landscaped resort grounds. An exclusive resort, accommodation is comprised of 63 fares set on the pristine expanse of beach surrounded by swaying palms. Enjoy an excellent range of facilities including the popular Infinity Pool Bar for an exotic cocktail by sunset. 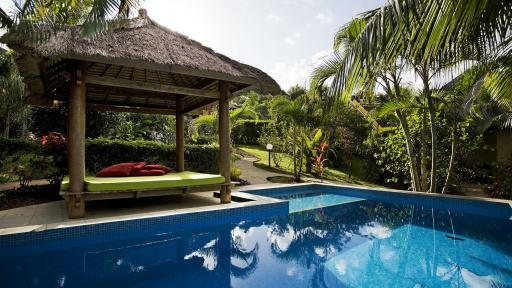 Just 5 kilometres from the airport and within walking distance of the heart of Port Vila, Chantilly's on the Bay offers lovely self-contained holiday accommodation. The private apartments feature beautiful individual sun decks with spectacular views and are air conditioned for your comfort. A full range of facilities include harbour-side dining, a full wall aquarium, saltwater swimming pool and a range of water sports. Escape reality and head to the serenely inspiring CoCo Beach Resort & Restaurant. 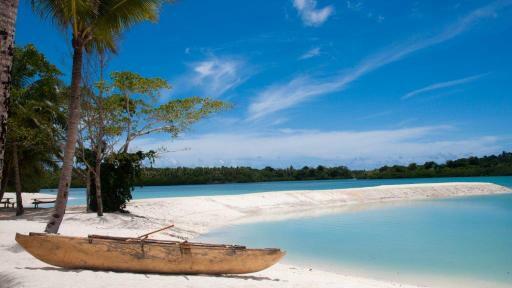 For those looking for a truly relaxing Vanuatu holiday you can't go past this amazing place. CoCo Beach Resort & Restaurant is located beachside at Paradise Cove offering an array of watersport activities, a sensational restaurant with ocean vistas as well as beautiful tropical fares dotted through the gardens or beachfront. Appreciate the comforts of home in your own private apartment or villa at Cocomo Resort Vanuatu. All rooms feature fully a equipped kitchen and laundry plus a dining area and a furnished outdoor balcony or patio. This Vanuatu accommodation is perfect for couples and families with access to a resort style swimming pool, a number of activities and a beautiful white sandy beach that leads into the lagoon. 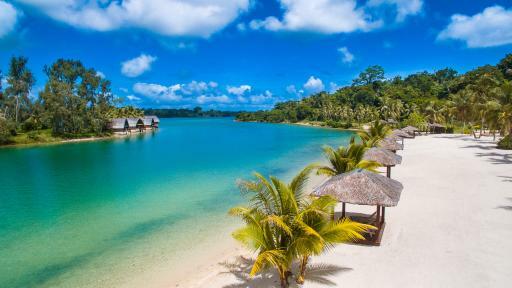 Relax, unwind and enjoy the tropical surrounds at Cocomo Resort Vanuatu. Just 10 minutes from the centre of Port Vila, Coconut Palms Resort features affordable yet well appointed accommodation with guest rooms and self-contained apartments. Enjoying a fantastic range of facilities, the resort features an expansive pool, sunset cocktail bar, onsite cafe, recreational games and a number of water sports and activities. Surrounded by the crisp clear waters of its namesake the Erakor Lagoon, Erakor Island Resort and Spa is just minutes from Port Vila. Set amid 16 acres of tropical island, the resort is connected to the mainland by a complimentary ferry. Some of the most popular facilities out of the excellent range offered at the resort is the day spa and onsite restaurant overlooking the lagoon, bungalows and waterfront. Located less than 20 minutes southeast of Port Vila, Eratap Beach Resort offers exclusive accommodation in a boutique resort setting. This high quality accommodation is surrounded by a pristine natural environment where you can explore a deserted island, spot giant starfish, swim the lagoon off the jetty and much more. Close to the city centre, Fatumaru Lodge offers intimate boutique waterfront accommodation. Just 10 minutes from Port Vila, the resort is close to shopping, dining and attractions yet enjoys a peaceful location. Featuring studios and units, accommodation is complete with fully equipped kitchens and enjoys access to the swimming pool, Jacuzzi, lodge jetty and pristine beach. 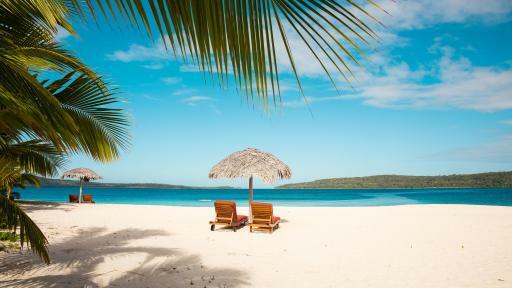 Just 15 minutes by bus or ferry from the airport and Port Vila, Hideaway Island Resort is an experience like no other. Home to a marine sanctuary, the resort is surrounded by white sand and turquoise water and is one of few places in the world where you can hand feed 'tame' tropical fish. 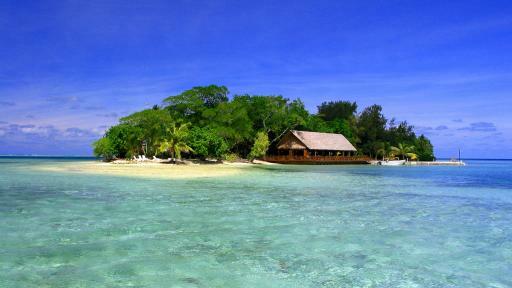 Close to a number of excellent dive sites, this Vanuatu accommodation offers a memorable experience. The island's premier deluxe resort, Holiday Inn Resort Vanuatu is a low rise property set amid 60 acres of lush tropical gardens and private beach frontage overlooking Erakor Lagoon. Featuring first class facilities such as a children's 'village', tennis courts and a 9-hole golf course, the resort offers villa accommodation linked by a suspension bridge and features a distinctly Melanesian atmosphere. 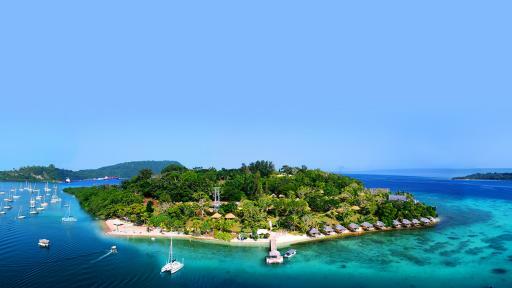 Vanuatu's premier boutique resort, Iririki Island Resort & Spa is known as the pearl of the South Pacific. 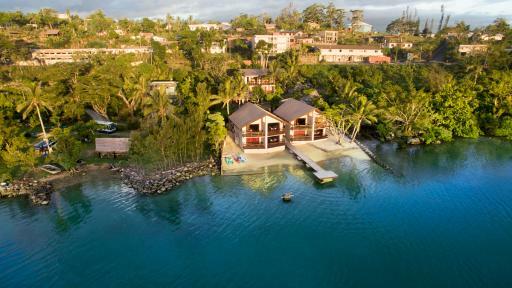 Set on the former British High Commissioner's residence, the resort enjoys 69 acres of island and is just minutes from Port Vila by a complimentary 24 hour ferry. With all the comforts of a luxury International resort, Iririki enjoys privacy in a prime position. A family friendly resort situated in the heart of the 'restaurant belt', Kaiviti Motel is located within walking distance of Port Vila's town centre. Accommodation features self-catering units that are close to a range of shopping, dining and entertainment options. The friendly staff and laid back atmosphere perfectly lend themselves to a home-away-from-home vibe on your Vanuatu holiday. An exclusively adults only resort, Mangoes Resort is nestled on a ridge right near the heart of the township in Port Vila. 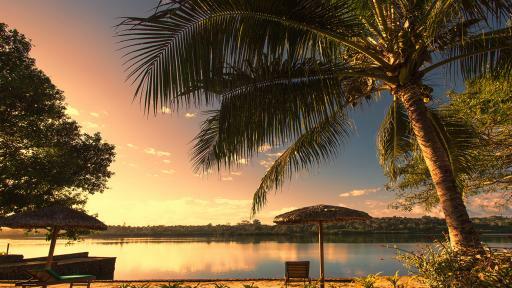 Looking out over spectacular views of Erakor Lagoon's pristine waters, the resort offers well-appointed and relaxing accommodation in a tranquil island setting ideal for couples wanting to holiday in peace, away from the bustle and noise of children. 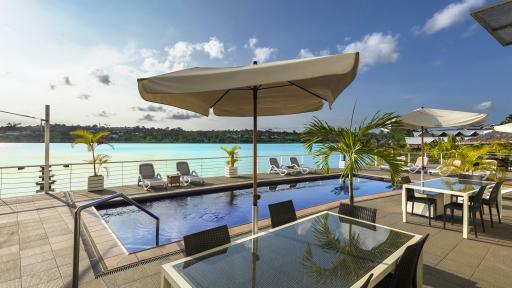 Located on Port Vila's beautiful harbour, Moorings Hotel offers stylish and contemporary accommodation overlooking the water's edge. Just 10 minutes from the airport and within walking distance of the town centre, the resort opens out onto an infinity pool by the harbour and enjoys a unique island atmosphere ideal for relaxing in the tropical breeze. This beachside Vanuatu accommodation features 43 spacious apartments that are idea for couples, families or groups. Enjoy a memorable and relaxing honeymoon or family getaway to Port Vila at Nasama Resort, unwind by the swimming pool, snorkel from the beach or head out and explore in one of the kayaks. The studios, suites and apartments all feature fully equipped kitchens, large balconies, WiFi, air conditioning and more. If you are looking for a self contained escape in Port Vila that is close to one of the main surf beaches then Nasama Resort is the perfect choice. Located 15 minutes south of Port Vila at Pango Point, Paradise Cove Resort offers intimate boutique accommodation. The villas are well-appointed and the resort allows only 30 guests at a time ensuring you a peaceful, private and flexible holiday. The private beach is ideal for swimming and snorkelling while the nearby local villages are just waiting to be explored or you can relax in a hammock sipping a cocktail. Set on the Erakor Lagoon's stunning shores, Poppy's on the Lagoon has been designed to take full advantage of the South East trade winds and enjoys cooling sea breezes. 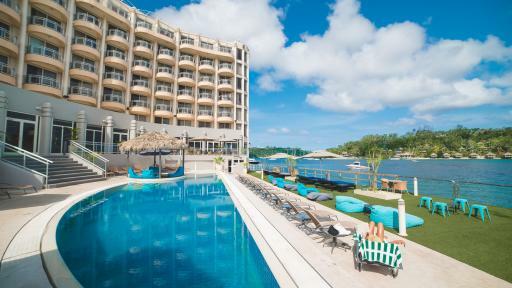 Just minutes from the centre of Port Vila and a myriad of shops, restaurants and attractions, the resort features lush gardens showcasing a variety of tropical flora. 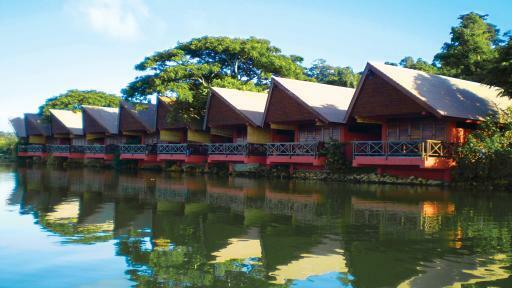 The Lagoon is also quite safe and is ideal for swimming and water sports. 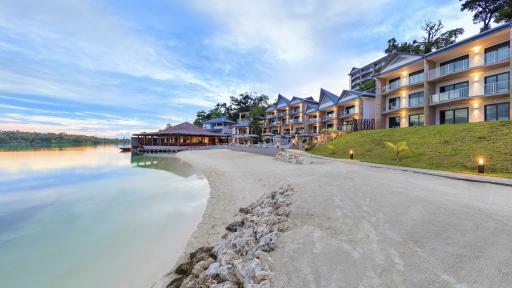 Overlooking the dazzling Erakor Lagoon, Ramada Resort Port Vila is a contemporary resort offering beachfront location and range of self-contained apartments. 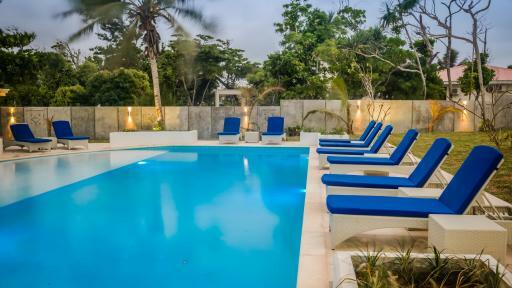 Located only 15 minutes walk from the town of Port Vila and 10 minutes drive from the International airport, the resort features a full range of facilities including a restaurant, bars, gymnasium and a stunning lagoon style swimming pool. A stylish, boutique resort, Sunset Bungalows Resort allows a maximum of 38 guests at any one time. Creating a peaceful and intimate atmosphere, the resort is just minutes from Port Vila and is particularly popular with couples and honeymooners. Designed to harmonise with the beautiful natural surroundings, the resort showcases spectacular sunsets and glittering night skies. 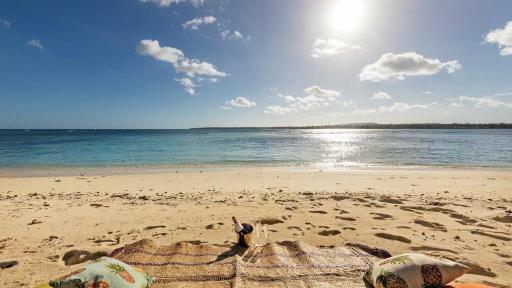 Tamanu On The Beach is the ideal Vanuatu accommodation choice for those who enjoy peace and quiet. 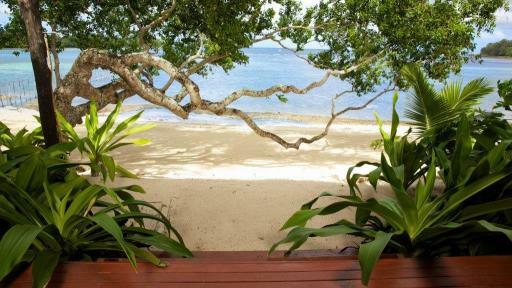 The property is set on 5 beachfront acres just 30 minutes from the airport and 20 minutes from Port Vila's CBD. The 500 metres of white sandy beach is the perfect place to relax, read a book or take an afternoon nap. Spend time at the day spa and enjoy fresh cuisine at the fine dining restaurant. Enjoying an enviable waterfront location, The Grand Hotel & Casino overlooks Vila Harbour and offers spectacular water views from each guestroom. Offering contemporary accommodation conveniently located close to shops, restaurants and markets, the resort has a range of excellent facilities including a pool overlooking the harbour, casino and full use of facilities at Iririki Island. Boasting Vanuatu's newest luxury accommodation, The Havannah Vanuatu offers spectacular ocean views and modern amenities. 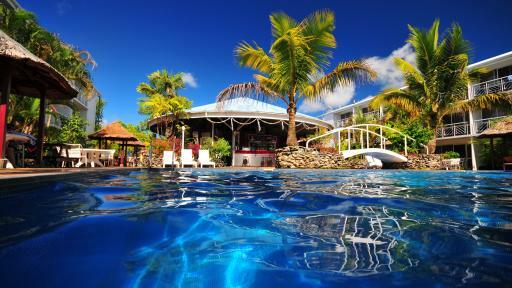 Accommodation is well-appointed and ideal for enjoying the tropical setting in tranquillity. Facilities include an overwater villa, plunge pools, a bar and restaurant and a range of activities as well as plenty of relaxing sunsets and ocean views. Offering something for everyone, The Melanesian Port Vila features a range of accommodation styles ranging from self contained apartments to rooms and suites. Within walking distance of shops and the Post Office, the resort enjoys a number of facilities including a pool, gaming lounge, two bars, a 24 hour restaurant, tennis courts and a private collection of crafts and artefacts. 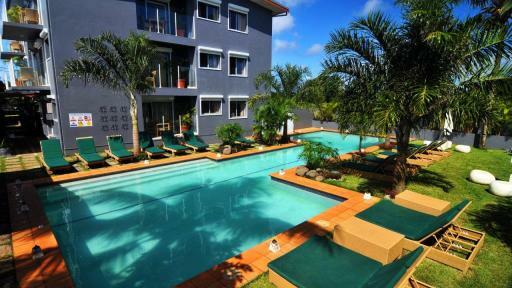 The Terraces Boutique Apartments is an exciting, modern self contained Vanuatu accommodation alternative. These luxurious and spacious apartments afford gorgeous views over the stunning Erakor Lagoon whilst set amongst tropical gardens. With the centre of Port Vila only a ten minute walk away, guests have the option to self cater or dine out, and are within easy reach of the best local sights and tours. Just 5 minutes from downtown Port Vila, Tropicana Lagoon Apartments offer spacious fully self-contained modern studio apartments complete with direct beach access. Surrounded by tropical gardens along a 60 m stretch of pristine beach, the resort features an over lagoon deck, beach bar, swimming pool, tour desk and complimentary shuttle service into town. If you are looking for seclusion, privacy and luxury, than look no further than Vale Vale Beachfront Villas. 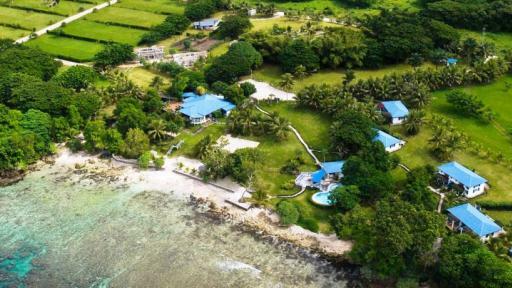 This beautiful self contained villa style accommodation is located on a 700 metre stretch of sandy beach at Pango, a short 10 minute drive from Port Vila. There are 8 one and two bedroom villas that are situated 5 steps from the calm water and feature floor to ceiling glass doors, private plunge pools, WiFi, and spacious living areas. 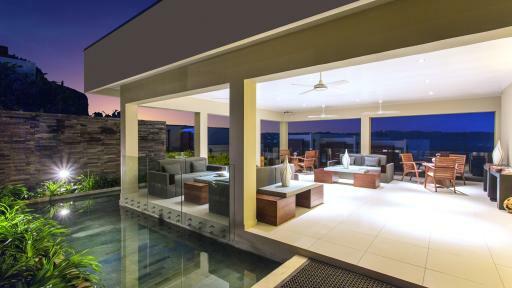 Vale Vale Beachfront Villas are ideal for groups of friends and family or are a perfect setting for that romantic getaway or honeymoon hideaway! French for 'charming cottages', Vila Chaumieres offers private accommodation away from the larger resorts. Ideal for food and wine lovers, accommodation features garden bungalows with air conditioning, refrigerator, ensuite and private balconies overlooking the lagoon. An adults only resort, the intimate atmosphere provides the perfect escape. 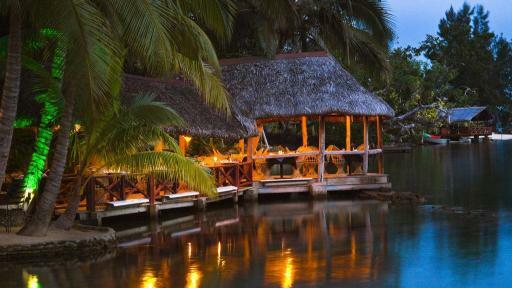 Set amid 75 acres of lush tropical gardens, Warwick Le Lagon Vanuatu is nestled on the shores of Erakor Lagoon. Accommodation ranges from Garden and Lagoon View Rooms to Bungalows and luxury Villas all with beautiful garden or lagoon views. Complete with traditionally thatched roofs and private patios or balconies, the resort is ideal for an authentic South Pacific experience.